But his comment got me thinking. Especially since he put #PMA at the end. I had to look up what that meant. (Positive Mental Attitude). Since the last thing I want to be is an old cynical political activist, which is a real danger in politics. I needed to humbly say…. Is he right? I think he may actually be right. With the POTUS race we were always on the attack of Obama and we failed to tell our stories. There is a great article out that my friend Chad sent me After the Crack-Up. Don’t miss the opportunity to read it. Here is an excerpt. “….if there is one thing conservatives can agree on post-election, it’s this: The dominance of the Left in the storytelling arena is making a difference at the polls. It’s impossible to measure, but anyone who doesn’t think it skews outcomes is living in an alternative universe. The fact is, it’s easier to sell a political narrative to America when it comports with the cultural narrative we see and hear every day. So here’s my story and why I fight. I am a Texas Mom who is scared to death that my children will not have the same opportunities that my husband and I had to succeed. I have spent the last 4 years pushing out information on what is actually happening on the ground in Texas and in America and the indoctrination of the progressive left into our homes, our schools, our churches and every aspect of our lives. I have been called crazy by some, a hero by others and a right wing extremist by the political establishment. Honestly I may be a little of all three, but when my 13 yr. old daughter thanked me for fighting to raise funds and help produce a video on the threat of what the Muslim extremists are planning for America I knew these battles I fight are worth it. Her future is worth fighting for. Here is a link to the short video if you have not seen it, Avoidable. Now what does any of this have to do with Joe Straus and the Speaker of the House race in Texas. Well the women I know at WomenOnTheWall.org believe we must Seek the Truth ~ Share the Truth and Stand for the Truth. The truth is, there is a dirty little secret in Austin. The Pledge Card System that we helped to expose is how incumbents stay in office. The state rep referenced above told me I needed to change my tactics of being ‘against’ someone. Well here is what I am for…. 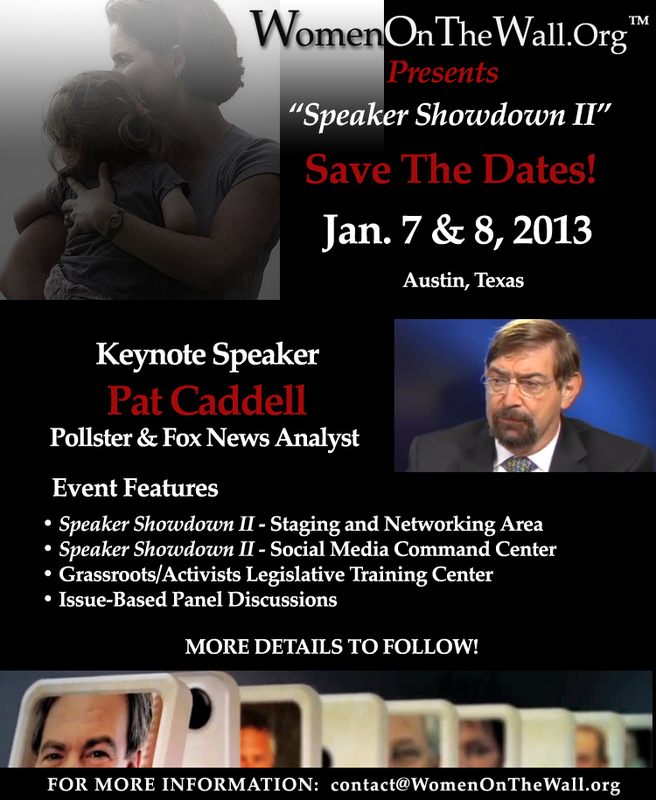 A Republican Speaker of the house who does not attend fund raisers for Democrats running against Republicans. I am for a Speaker of the House who does not seek retribution and have discontent towards Conservatives. I am for a Speaker of the House whose family’s business is not banking on gambling legislation to be passed and who stands to make millions if it does. I am for a Speaker of the House who does not have a proven track record of close ties to the largest Democrat donor in the state of Texas, Steve Mostyn. I am for a Speaker of the house who is for giving power to State Representatives so they can represent the people they are elected to serve. I am for a Speaker of the House how does not put Committee Chairs in place to Kill Conservative Legislation. So call me crazy but I want someone as Speaker of the House who will provide an economically sound, safe and secure Texas for my 3 children. That is why I am for David Simpson for Speaker of the Texas House. If you are a Texas State Rep. and can prove to me why Joe Straus is a better Speaker than State Rep. David Simpson please tell me why. Please do not say it is because it’s better to go with the Republican Establishment than to not stand on the “Texas Conservative Values” you ran on. If that is your answer you do not deserve to be representing the state my children’s future depends on. What is the real suicide mission? Texans are tired of the inside deals being made for key chairmanships; for example public safety or financial services in exchange for a vote for Speaker of the House. There is the perception out there that the people we elect to actually make laws are the very people who think they are above the law. Remember perception is everything in politics. Please take the time to read…..
Below is an analogy one State Rep. used to describe the vote for Joe Straus. My suggestion for this State Rep. follow the compass and your core convictions. We are not sailing we are trying to save our state and our nation. Truth matters and corruption in politics is what got us in this mess. What key positions have you been promised from Speaker Joe Straus, his political consultants, financial backers or key lieutenants? Remind them that is is against the law for them to vote for Joe Straus in exchange for these key chairmanships or committee assignments? Remind them that they represent the people who elected them. If they feel threatened or that it is a suicide mission to vote against Joe Straus for Speaker as some have characterized it as, then they are a part of the inside corruption of Texas politics and the voters of Texas are becoming informed and engaged and will do everything within our power to remove them from office in the primary. So as I see it, it is a suicide mission to vote for Joe Straus for Speaker of the house. That is if “Suicide” means losing your job as Texas State Representative. I have also included links to their Chief of Staff if they have one named and their e-mail as well as the Austin office number. I believe we need to let the their Chief of Staff know we mean business and we are not going away after the election of speaker no matter who is named as Speaker of the House. Here is a little reminder of the corruption in Texas politics that Grassroots/Tea Party activists have been standing up against. For 25 years as a development consultant to the Pro-Israel movement, I have witnessed firsthand the “shoot and scoot” diplomacy of the Palestinian people. Shoot, retreat, and declare victory at the expense of millions of people, both Palestinian and Jewish. Terrorists are a predictable lot and are aided by a mainstream media that seems to coddle them with tender loving care and an American electorate that easily loses focus on international crisis. As Mark Steyn so eloquently states in “Jill Kelley for Secretary of State,” the post-Thanksgiving reality of “inflamed mobs clubbing holiday shoppers” took American front- page headlines over world headlines of the overarching authoritarian expansion that Egypt’s President Mohamed Morsi – the new Pharaoh of the Middle East – gave to himself as ruler of Egypt and the Muslim Brotherhood. While some of us were watching the mobs of people in Cairo rioting, signaling an imminent NEW crisis and de-stabilization of the Middle East, much of America took to the malls with bellies full of turkey and stuffing. After all, it is more important to get a bargain at the mall, hear Jingle Bells by Santa Clause than it is to understand, fully, the implications of a full-blown war in the Middle East where, potentially, hundreds of thousands of innocent people will lose their lives. I care and millions of people who take the time to understand that Israel sits on the front lines of Western Civilization. The “Sunday Times of London” reported that Israel has captured on satellite surveillance this weekend the stockpiling of Fajr-5 weapons onto Iranian ships headed, no doubt, for Gaza. The Fajr-5 rockets are the long-range missiles that were destroyed in Gaza by Israel’s “Operation Pillar of Defense/Cloud.” These are the missiles which targeted neighborhoods in Tel Aviv and Jerusalem as opposed to the short-range missiles that rain on Israel every day of the year. Moreover, it is also reported that these Fajr-5 are also headed to the Sudan where they will be used by Al Qaeda operatives in the Sudan to target a broader landscape of Israeli cities. Did you think that Hamas was not going to regroup and rearm? Israel remains the only DEMOCRACY in the Middle East and it votes with the United States in the United Nations 100% of the time. What is clear to me, and should be to you, is that the Muslim Brotherhood ( a worldwide umbrella organization of all the terrorist organizations) not only negotiated the Israeli-Gaza cease-fire, but they became greatly empowered by it. Al Qaeda is on the rise throughout the Middle East and in Northern Africa as well. In my podcast linked here, I ask that the American people arm themselves with knowledge. I hope you will take the time to listen and to share this newsletter with friends. Please know that millions of Israeli lives were saved during “Operation Pillar of Defense” due to American support of the Iron Dome. Those Americans who lobby Congress and our Congressional delegations who vote in support of Israel each year for this support should be commended; they are greatly appreciated by the Jewish people worldwide. We must be relentless in our demand of our federal officials to continue its military support to Israel. On behalf of Israel, I thank you for your continued concern for Israel. It is not only the “Land of Milk and Honey,” but is the home of nearly six million who value democracy, freedom, and personal liberty. Yes Bryan Hughes is a trial lawyer, yes he is a Conservative Trial lawyer who has voted in favor of every major piece of tort reform. Let’s take a look at Speaker Joe Straus, a business owner of bankrupt racetracks who has partnered with Vegas gambling interests. Retama strikes deal with Vegas company. Retama Park opened in 1995 and has never made money. The track’s owner, Retama Development Corp., a municipal subdivision of Selma, filed for bankruptcy in 1996. It emerged from bankruptcy a year later, shedding some of its debt. Todd Eilers, a securities analyst who follows the gaming industry, views the deal as a “defensive move” for Pinnacle. It has three Louisiana casinos that draw Texas gamblers, so those properties could be hurt if Texas ever adds gaming. 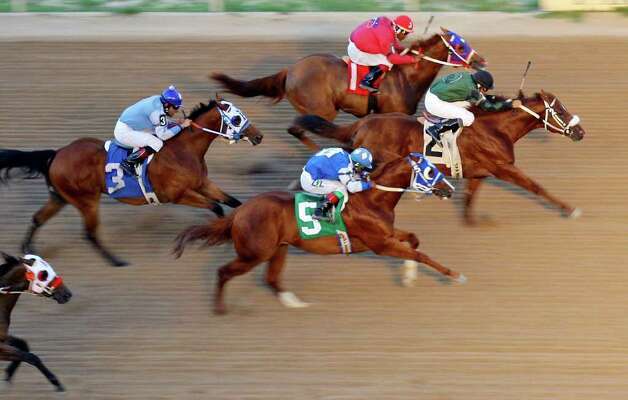 State lawmakers would have to be persuaded to let voters decide whether to allow gaming at Texas racetracks or elsewhere. Track officials previously have said they wanted to bring in a financial partner to fund the track’s losses while they pushed for legalized gaming at state racetracks. So, I ask Texas State Representatives are you going to stand with an “Establishment Republican” known for making deals; whose family stands to gain millions if gambling is passed in Texas or are you going to stand with the most Conservative candidate in the race for speaker who is known for standing up for what is right for Texas not what is right for his own personal gain. The question is what did he promise for that vote. We are hearing reports from State Reps. that Joe Straus has given them key Committee assignments. How could they vote against him? The challenge is that is against the law. Are you as tired as I am of elected officials ignoring the rules and the laws of the land?